, you realize that 2009 was an extraordinary year for female filmmakers. From newcomers to veterans working at the top of their game, the renowned Oscar winning Salaam Bombay! 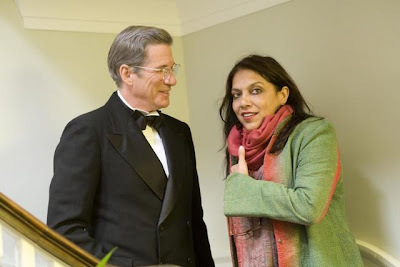 director Mira Nair proved she was no exception to the trend by tackling what-- after Bigelow and Ephron-- was undoubtedly the most ambitious female helemd work of the year with her biopic of Amelia Earhart. In fact perhaps, due to the word-of-mouth campaign that steadily attracted people to Bigelow's Locker and Ephron's Julia, it was Nair's Amelia that was under the most scrutiny not only because of its subject matter in centering on—as press notes reveal-- still one of the ten most famous Americans of all time but also because it involved two-time Oscar winning actress Hilary Swank. For, with Swank aboard, as early as last spring trades and reporters began assuming that Amelia would be in the running for an Academy Award. However, the film's take-off was rocky at best as Nair's biopic received a weak welcome for what was said to be a dull, incredibly lengthy dud, making viewers stay away in droves, regardless of the fact that it clocked in at a mere 111 minutes. Yet, unfortunately after seeing the film on gorgeous pitch-perfect Fox Blu-ray (aka the studio that can make even the Dragonball movie look good), I must admit that I was already checking my watch at the twenty minute mark, which is never a good sign. Moreover, if you would've asked me to guess how long the movie was off the top of my head, I would've estimated that the running time was closer to three hours or at least in the ballpark of Martin Scorsese's superior yet again overly long Howard Hughes biopic The Aviator. 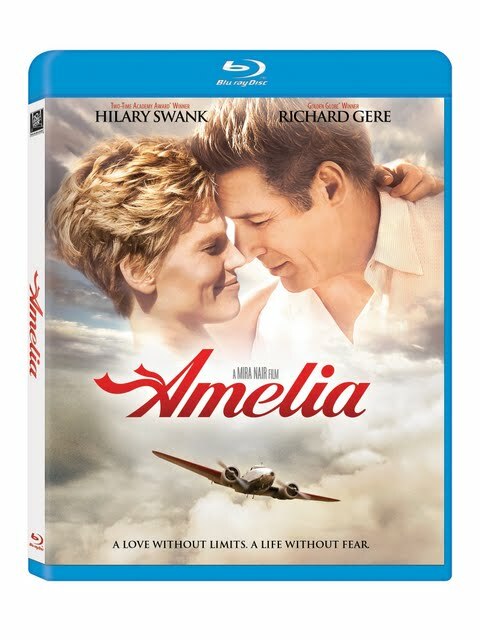 Like Julie & Julia, Amelia was also drawn from two nonfiction works but unlike Julia, two screenwriters were involved on a film that centers primarily on its title character instead of two equally vital narrative plot-lines set decades and miles apart as in Julia. 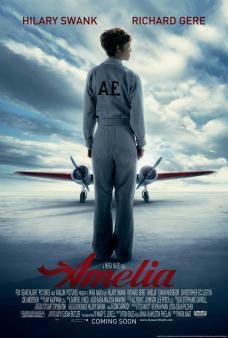 Similarly, Amelia utilized the efforts of two film editors, making me wonder just what was removed and if perhaps a much better film can be found on the cutting room floor, as we're missing the entirety of Earhart's childhood and instead dwell far too long on her doomed flight in which she vanished. Throughout the picture, Nair's editors cut back and forth to Earhart's final flight even to the point of morbidly opening the movie with it, which feels like a major storytelling mistake since ultimately we're left with the uneasy feeling we didn't have going in the cinematic presentation that perhaps Earhart wasn't as prepared or skilled as we thought but rather naïve, reckless, and willing to put both herself and her crew at risk from ignorance. Although to be sure, this is the last thing in the world we want to be thinking, the film's emphasis on failure assures that's what we take away from it. 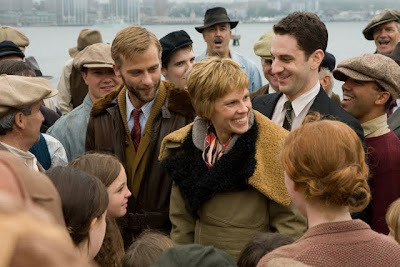 Predictably, Swank is perfectly fine in her role, when viewed after the irresistible turn by Julie & Julia's Amy Adams in Fox's Night at the Museum sequel, I couldn't help but wish that this Earhart would've been allowed to really connect with us or that we knew her even a fraction better than just the legend she was and is, which is how the film opens and maintains. Although Gere raves about the talented Swank in a behind-the-scene featurette, as far as this film is concerned it's actually Gere that should be praised by turning in his finest performance since Chicago as publisher George Putnam. 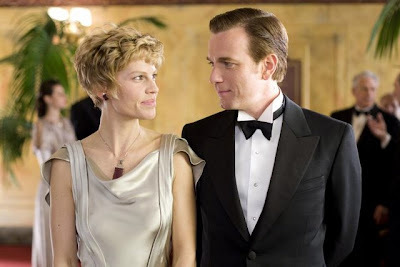 Able to move from professional and personal in his relationship with the woman whose public persona he practically creates to loving so much that he was willing to overlook her affair with the dashing Gene Vidal (Ewan McGregor), Gere is easily given the greatest opportunity to break free and soar by reacting as a human instead of being fed Earhart's quotable legend lines. Unfortunately the rest of the movie felt like-- to misquote John Travolta in Pulp Fiction-- "a wax museum with a [ very faint] pulse" as despite the film's constant reminder to take it all so seriously as an "Oscar Contender," it's basically extended yawn. And when Amelia is combined with Nair's Vanity Fair we're left with the same “run for the exit” feeling of Wong Kar-Wai's extraordinarily uninvolved, slow-moving 2046 or Francis Ford Coppola's Youth Without Youth. And while I wanted to praise it even the slightest bit more, mostly I just wished it wasn't so episodic as it strings together some great sequences like taking Eleanor Roosevelt for a trip in the air and meeting the youngest female flier but never connects the threads, just dropping them to move right back towards the doomed finale we see coming as soon as the movie begins. And just like Michael Mann's stylistically inappropriate Public Enemies which felt like an HD Dogme depression era movie, Amelia relied too heavily on the green screen, pulling you right out of the movie frequently because the CG is never quite believable. A major disappointment in deviating from the style Nair is famous for when using her frequent collaborator Declan Quinn as a DP, the changes led me to believe that ultimately Nair and her new cinematographer Stuart Dryburgh may have had two entirely different aesthetics in mind, making them as baffled as the audience. Although I was ever quite sure just where exactly the plane began to descend, I had the sneaking suspicion that-- perhaps like Earhart's final flight-- it was doomed from the start. Per usual, Fox does a phenomenal job transferring the warm nostalgic hues in the original picture and reproducing the timbre of the sound in Swank's accent, the Blu-ray's main saving grace is in the amount of source material it possesses on Earnart herself including old newsreel footage. Overall, I'd urge you to go right to the authentic footage if you don't fall asleep beforehand, as it's much more fascinating than viewing the Behind-the-Scenes featurette which mainly consists of the cast and crew talking about how much they admire Earhart and suspiciously not a lot about the movie they ended up releasing in 2009.